Gibson introduced their thin-body, 1 pickup ES-225T guitars in 1955 and in the following year, they offered a companion 2 pickup version. 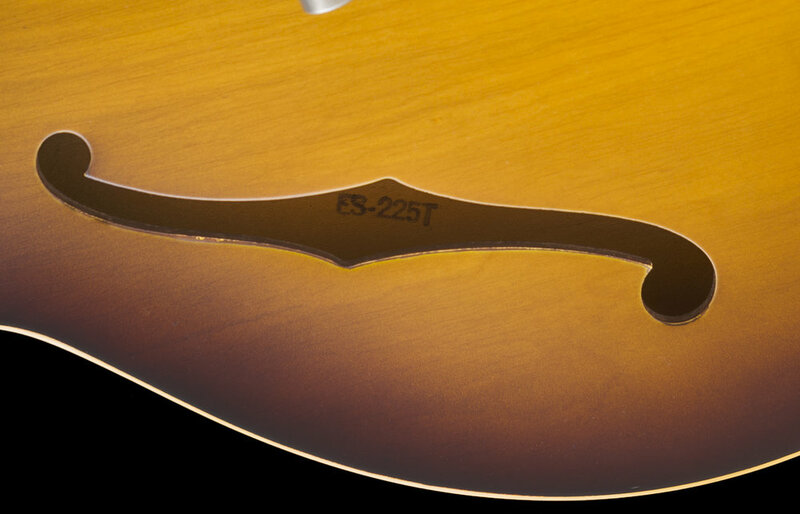 The ES-225 series were produced up to and including 1959 when they were discontinued in favor of the recently introduced "double-cutaway," thin body ES-330 guitars along with the revised single-cutaway ES-125 models. 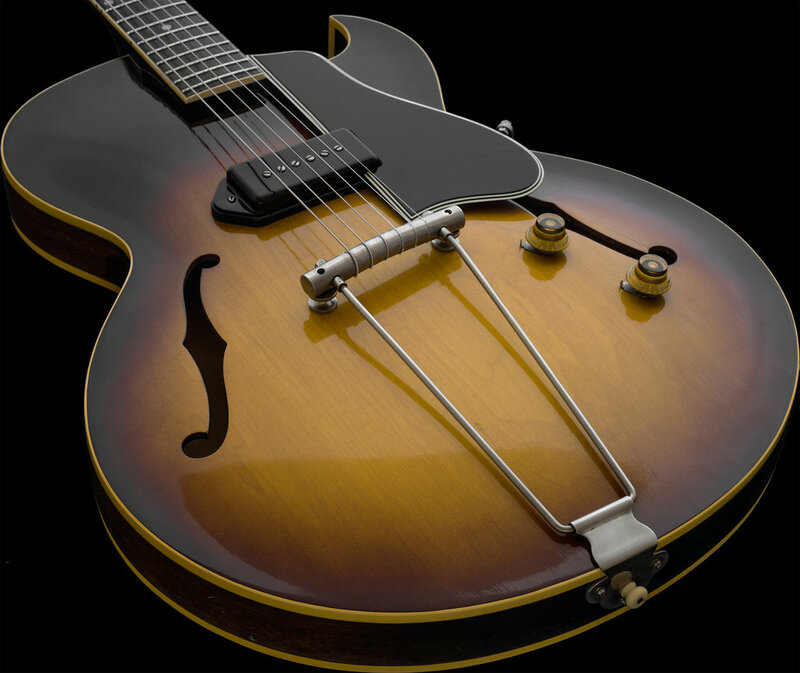 On these 1 pickup ES-225T versions, Gibson placed the P-90 pickup halfway between the fingerboard and the earlier style Les Paul combination bridge/tailpiece. Gibson determined the pickup placement would provide a unique tone, and they do! These have a tonality that is not attainable with a single neck or double pickup guitar, making them attractive to anyone desiring something a bit different! I have examined, tested, serviced and set-up this instrument and found it to be factory correct. The only non-original item to mention is a heel installed Strap Button that was done prior to my acquisition of the guitar. The electronics, frets, nut, finish, tuners and both the plastic and nickel-plated metal hardware are all correct and original to the guitar. The 2 potentiometers are matched and dated the 41st week of 1958 and have a bumblebee capacitor attached too. The ergonomics of this model are very good. They are lightweight and allow access to the upper frets due to their Florentine cutaway. The solid 1-piece mahogany neck construction provides a very sturdy feel. The shapes are typically a large "C" which is round and full feeling, but very comfortable in my hand. The overall condition of the guitar is very clean with a glossy finish and some minimal light finish checking. Globally it displays only minor wear and blemishes, which my large and clear photos will show. The back of the body has some light impressions into the wood and other usual signs of age and light usage, but it's minimal and does not detract from the warm vibe and pleasing appearance of this vintage Gibson. I am rating the guitar a conservative 8.5 out of 10 in overall condition. The CASE is an original issue Durabilt model that is in "good" condition. The majority of these soft cases have deteriorated and fallen apart, especially if they had gotten used. The factory-issued Durabilt cases are soft-shell (pressed paper) and are fine for storing instruments but are NOT up to the task of protecting them during normal usage outside the home. Please note that any ES-335 style hard shell case can be substituted for this model guitar. The guitar has just been set up with D'addario XL 10 - 46 gauge strings. If you have any desire for a fun and reasonably priced Vintage Gibson P-90 thin-line, kindly do inquire. Weight: 5 lbs. 12.6 oz.